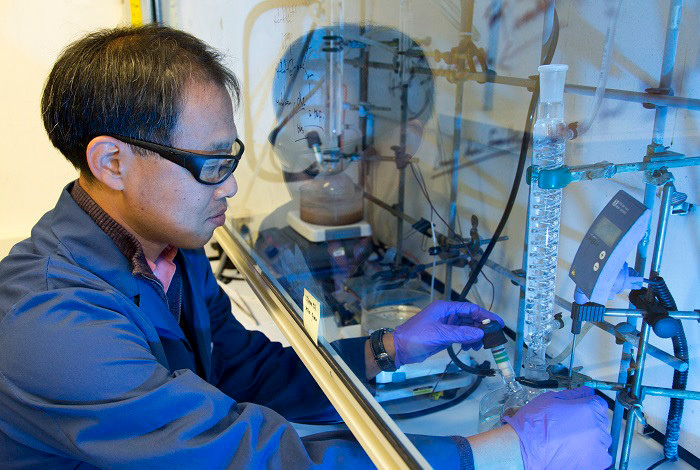 Fuel-cell research has been a hot topic at Los Alamos since the 1970s. Today, with solutions to energy-security challenges a key component of the Lab's global security mission, scientists continue to search for novel solutions to current fuel-cell limitations. One solution proposed by Dr. Yu Seung Kim of the Lab’s Materials Synthesis and Integrated Devices group is fuel cells designed with an ion-pair coordinated polymer membrane. This new design will increase the range of temperatures a fuel-cell can reliably function in, as well as increase the power of vehicles. For more information on the ground-breaking work of Dr. Kim and team, please join the conversation at UnQuarked on Monday, February 11.